2019/04/23 2019 is your year to demolish any barriers that have been holding you back, Scorpio! With clear thinking and sheer force of will, you can accomplish what your heart desires and what your head knows you need.Have more patience and charm this year, too. 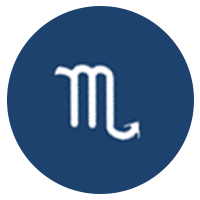 This assures that more problems are solved than created and that you make more friends and allies than you risk losing.Your most productive time may be in the spring when Mars is retrograde in Scorpio. This slow, strong Mars will make you even more methodical and irresistible.Tenderness and tact are also highlighted skills for you in 2019. Be realistic and kind, especially in the late summer and early fall when Jupiter and Mercury increase your people skills. Watch as obstacles and opposition melt away under your gaze.It will be in the realm of family and friends that you may see the most progress. When things are going smoothly at home, career and public life are much easier. What a dynamite year!